Stained Glass Domes for Resorts from Stained Glass Inc.
Stained glass domes are both beautiful and grand, making them perfect for any resort. Stained glass domes immediately inspire awe in viewers, and they can have a variety effects on the perceived scale of a room. 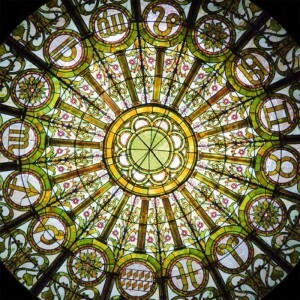 Stained Glass Inc. provides a variety of world class stained glass domes that are both affordable and easy to install. The colors in a stained glass dome can do a lot to either cloister or open up a space. Darker, rich colors may seem to make a space smaller and more intimate, while lighter colors may give the impression that the space is larger and more spacious than it may actually be. The master artisans at Stained Glass Inc. are experts when it comes to picking out colors and designs for the desired effect. Whether you have an entry hall that you want to appear more airy and spacious, or you have a restaurant or bar that you want to appear more intimate, stained glass domes will look fantastic at your resort. Old fashioned stained glass domes are incredibly heavy and difficult to install. Many of them require specific architectural support to be built into the structure in order to hold them aloft. Stained Glass Inc. has a solution: lightweight stained glass domes that are easy to install and easier to maintain. Our world class stained glass domes can be installed in virtually any structure and require very little in the way of architectural support. No matter the scale of your establishment, we can find the perfect stained glass dome to fit your resort. One of the advantages of working with any member of the Stromberg Group is the ability to custom-design your order. 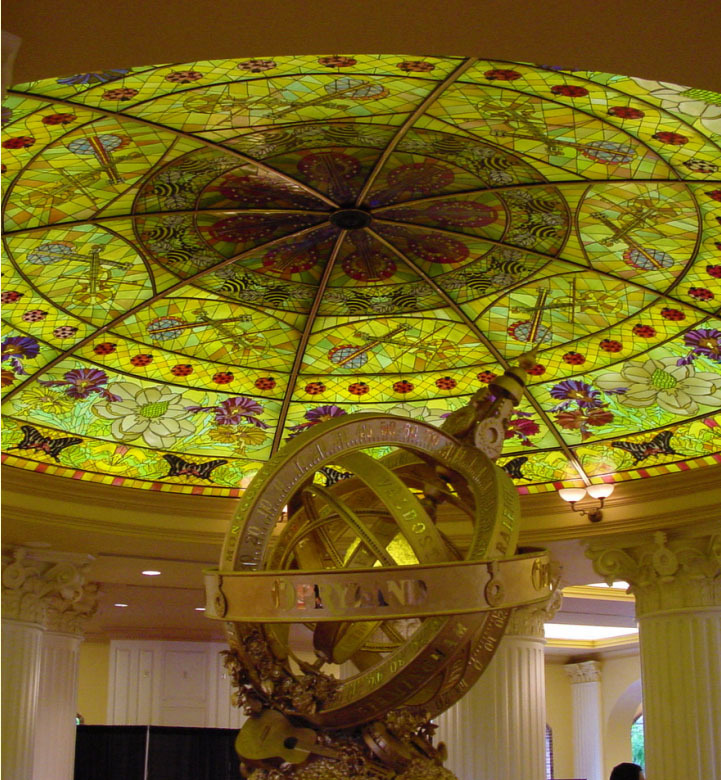 With Stained Glass Inc., we can design your stained glass dome with any design you can dream of, and we can build your stained glass dome to fit in any space. Whether you are looking for something in more of a Tiffany style, or you are looking for something a bit more traditional and ecclesiastic, if you can dream it, we can design it. Better still, due to the durability of our polymer blend, you can be sure that your custom-designed stained glass dome will be appreciated for generations to come. Interested? 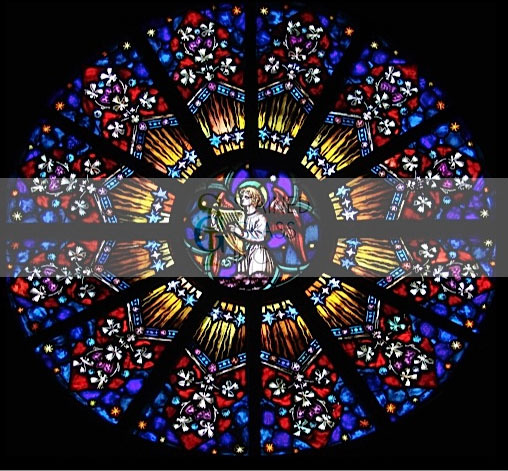 For more information about how to custom-order your own stained glass dome, or for an estimate, contact us today by visiting our contact page or calling us at 903-454-8376. Our team of expert artisans and craftsmen are on call and excited to work with you to make your dreams of stained glass a reality. A signature element of some of the world’s most ancient and revered churches, the stained glass dome is an architectural element that provides the effect of illuminated heavens. Beautifully intricate stained glass domes evoke old world charm as well as a sense of the divine, making them perfect for use in a church. Of course, the old style of stained glass, which is made up of dense metal and weighty glass, is incredibly cumbersome, expensive and difficult to install. Fortunately, Stained Glass Inc. has a solution for that. Stained Glass Domes from Stained Glass Inc.
Stained Glass Inc. is one of the foremost manufacturers and distributors of stained glass domes. With an ingenious combination of modern techniques and hybridized, light-weight materials, Stained Glass Inc. has engineered a stained glass dome that is not only affordable, but also easy to install. Additionally, Stained Glass Inc. has pioneered the usage of sophisticated fastening systems which allow for these domes to be hung from an all but invisible support system, so they can be installed in virtually any space that could benefit from a stained glass dome ceiling. One of the disadvantages of working with real stained glass is that it requires natural backlighting for the effect to be visible. Stained glass domes from Stained Glass Inc. can be backlit with warm LED light sources that illuminate the stained glass regardless of the time of day or presence of natural backlighting. No matter how big or small your church is, we have a stained glass dome that can fit your space. Even if there is natural backlighting to illuminate your stained glass during the day, our illuminated stained glass domes can be turned on to light up ceremonies that take place after dark, like Midnight Mass, or even just for rainy, overcast days when the sun isn’t out. Beautiful Stained Glass Domes from Stained Glass Inc.
Stained glass domes have always been a feature of affluence, wealth and power. Historically, they can be found in grand churches and cathedrals, affluent private homes, luxurious hotels and resorts, and significant government and civil buildings. Of course, the reason stained glass domes have so long been associated with affluence, wealth and power is because they are expensive to manufacture, difficult to install and costly to maintain. Fortunately, a new company, Stained Glass Inc., has developed a new method of manufacturing stained glass that enables the production of affordable stained glass. Who is Stained Glass Inc.? Stained Glass Inc. is a member of the Stromberg Group, an affiliation of companies, based out of Greenville, Texas, that are known for their ingenuity and problem solving prowess. Stained Glass Inc. is one of the world’s largest manufacturers of stained glass, and due to their rigorous production schedule and high quality product, they are able to provide world class stained glass for a fraction of the cost of the competition. Not only are these domes less costly to manufacture, but due to their comparable light weight and their durability, they are also easier to install and maintain. Stained Glass Inc. has a remarkably wide variety of stained glass window and dome patterns to choose from. However, because of Stained Glass Inc.’s ingenuity and flexibility, they are able to able to accommodate any custom design orders as well. One of the disadvantages of working with stained glass is that it requires natural backlighting for the effect to be visible. Stained Glass Inc. provides a clever solution to this problem. Stained glass domes from Stained Glass Inc. can be backlit with warm LED light sources that illuminate the stained glass regardless of the time of day or presence of natural backlighting. This opens up all kinds of opportunities for use in locations that otherwise could not accommodate stained glass such as hospital and airport churches and prayer rooms, hotels, bars, and restaurants, and even government buildings. We offer stained glass domes in any size, any design, and any color that are sophisticated and gorgeous. 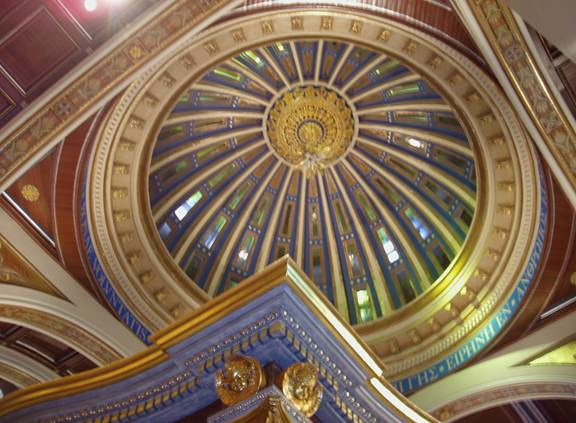 Our stained glass domes can be installed wherever you need a breathtaking ceiling. Stained glass domes attract the eye and inspire the imagination. Whether it’s a lobby, an area above a stairway, a library, or a solarium, practically nothing brightens and transforms a space like a translucent stained glass dome from Stained Glass Inc.
We will work with you to create a stained glass dome that features a flawless design and an impeccable combination of color and light. Add a family crest, school motto, or company logo to make any stained glass dome unique. With Stained Glass Inc. as your supplier, you will get the dome you want, built your way. 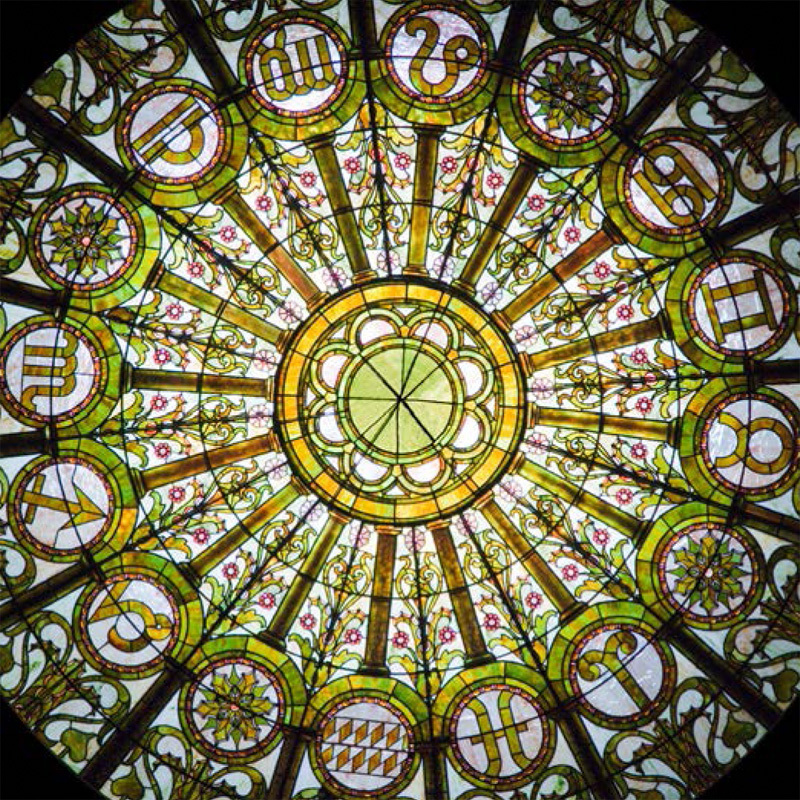 To enhance the beauty of your stained glass dome and help you create a cohesive, unified look, we can also supply a variety of custom complementary elements for your translucent stained glass dome. These include magnificent trim, moldings, columns, and coves. To find out more about our services, materials, and custom design process, send us a message through our contact page or call us at 903-454-8376. You can also request a free initial consultation to discuss the details of your stained glass dome project at any time. We are always here to help.